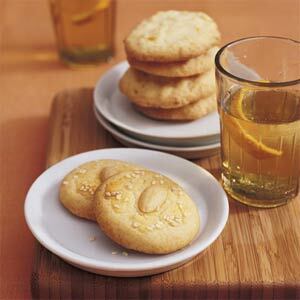 Chinese almond cookies are an incredibly delicious and nutritious snack. They are quite easy to make and can also serve as an excellent present or a sweet addition to a potluck supper. First of all, you have to preheat your oven to around 325 degrees Fahrenheit (162.5 degrees Celsius). Take a large bowl and put the flour, baking powder, salt and baking soda in it. Mix all the ingredients well. Then, take a medium bowl and put butter or margarine along with sugar in it. Beat the butter and sugar with an electric mixer. After that, add the egg and the almond extract in the mixture and beat it again. Add the flour mixture to the butter mixture and mix them well. You have to mix until the mixture becomes a dough. In order to properly work the dough, you have to use your hands (make sure you wash them before diving in). After that, make rolls of the dough and put them in the refrigerator for around two hours. It is extremely important for you to wrap the rolls before placing them in the refrigerator - use aluminium foil or cling film. Then, take the dough out of the refrigerator and make balls out of the rolls. Meanwhile, prepare a baking sheet by spraying some oil on it. Place the balls on the cookie sheet. There must be at least a 1 ½ inch gap in between the cookie balls. Then, you have to brush all the balls with the beaten egg, and press an almond half into the top of each. Put the cookie tray in the oven and bake the cookies for around 15 to 18 minutes. You have to bake the cookies until they become golden brown. Now, take the cookie tray out of the oven and put it aside for a while so that the cookies can cool down. Take an airtight container and put the cooled cookies in it. Keep the container closed, and eat the cookies whenever you wish.